Impatient | Frankly, My Dear . . . This should be my fourth installment of my TGIF posts. But I’m just impatient. I finished all hurdles with KICKSTARTER except for one: their review process. It’s going to take a day or two (or so they tell me) before my Campaign can go live. You’ll be the first to know! I’m thrilled that I finished my simple video. A no-frills Cookbook deserves a no-frills Commercial, and I’m really proud of it. Not to mention, I’d never edited a video before except vacation photos… so I think I did pretty well. Today my Boss is out of the office. I’m pleased that she trusts me and my coworker to run the business while she’s out. Yesterday she took time to nearly apologize for correcting me. She thought I was upset at her for nitpicking. Not at all! I’m upset that I still don’t know everything. See… impatient! 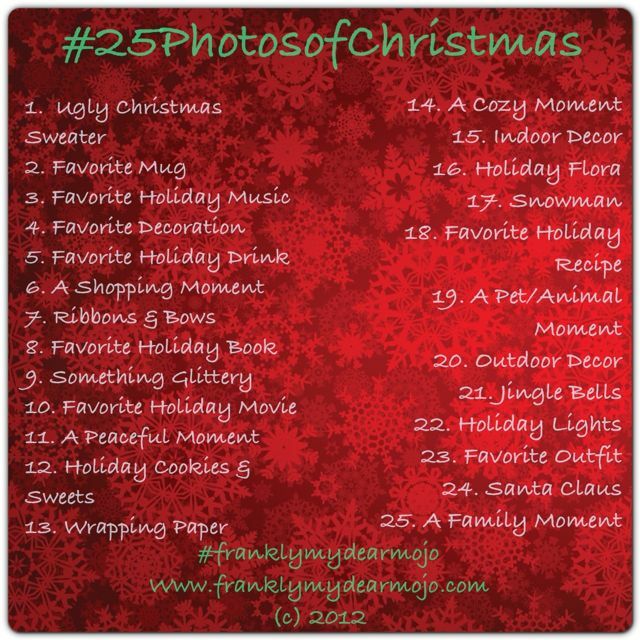 Tomorrow starts my #25PhotosOfChristmas on Instagram. We’re also waiting for that. Time to dig out your Ugly Christmas Sweaters! I do hope today is a fast day. But with it being a Friday, the last day of the month, no Boss in the office, and me eagerly waiting approval from Kickstarter, I just know I’m going to be impatient. Oh my… the Gone With The Wind reference!